This example shows how to read an image into the workspace, adjust the contrast in the image, and then write the adjusted image to a file. This example shows how to automatically detect circular objects in an image and visualize the detected circles. This example shows how to perform image preprocessing such as morphological opening and contrast adjustment. Then, create a binary image and compute statistics of image foreground objects. This example shows how to use array arithmetic to process an image with three planes, and plot image data. Many images are represented by 2-D arrays, where each element stores information about a pixel in the image. Some image arrays have more dimensions to represent color information or an image sequence. 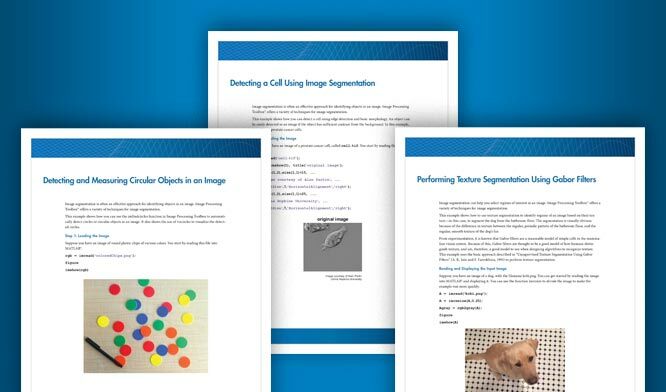 Learn how image locations are expressed using pixel indices and spatial coordinates.